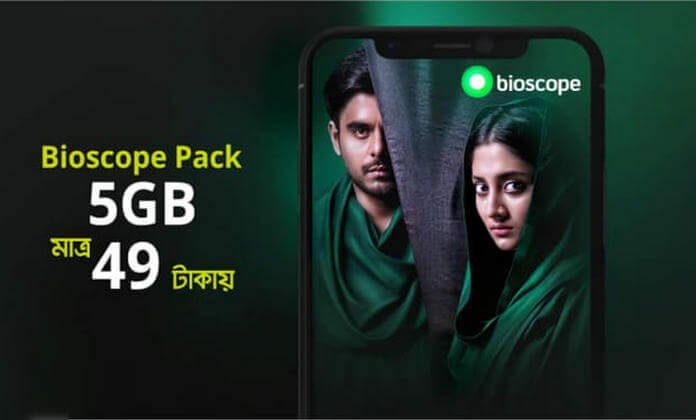 Grameenphone 5GB 49 Tk 2019 Bioscope Pack! Grameenphone offers 5 GB internet at just Tk 49, and all the customers in the GP can avail this offer. Friends, this internet package is applicable only for viewing the Bioscope. In other cases, this internet cannot be used. Bioscope is a video watching service from Grameenphone, where there is much more to be seen from the Movie, Bangla Natok than the TV show. Full HD movie original prints and telefilms are available Bioscope. The most popular internet packages in 2019, Follow the rules below to buy this special internet package for Bioscope. 5GB @ Tk 49 Bioscope internet pack. The validity of the package 30 Days. This internet package is used only for Bioscope. 2G, 3G, 4G network support.